Have a hot tub and don't use it anymore, or have you bought a house and the old hot tub came with the purchase? 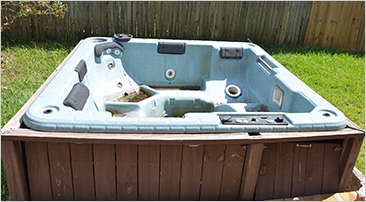 No problem, our friendly workers can come and remove the hot tub for you at a great price. These things can be massive and very heavy to deal with. Whether it's in the back yard, on the patio or deck, or sunk down in the deck, we can get it done while you sit back and relax, as we clear that eyesore from your residence. BEE JUNK FREE offers Hot Tub Removal and other Junk Removal Services to clients across Peterborough, Lindsay, Port Hope, Cobourg, Bowmanville, Courtice, New Castle, Kawartha Lakes, Campbellford, Whitby and Oshawa, ON.